On the Lust-have List ❤ Lace-up flats! 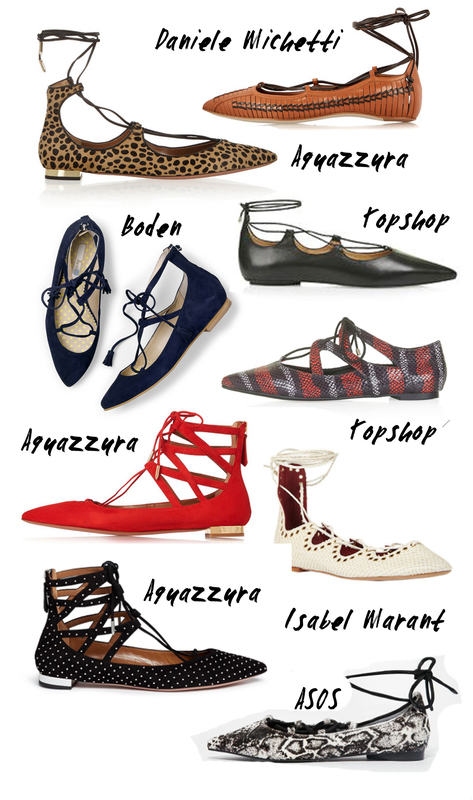 I’m all tangled up over lace-up ballet flats! I know they’ve been around since Spring when Michael Kors paraded his Kallie leather lace-up flats in a perfect monochrome look, but I was far too wrapped up in airing my toetsies and the lace-up open-toed cousin to give these beauties a glance – well I’m looking with great wide eyes now! While the classic ballet pump is a staple in most well-curated footwear collections, this season’s version are a fun and chic upgrade with their lace-up detail and a contemporary addition that can be worn with dresses, skirts, shorts and denims – erm, most thing really. Plus, they are the perfect shoes to continue the walk into a new season, even more reason to get them right? The most popular of the season seem to be the Aquazzura, (seen on pretty much every blog and intagram account as well as Hollywood’s elite – which must say something) but if you’re looking at a little less of an investment, then there are loads of high-street and online options too. Check out Topshop, Freepeople, Asos, Stuart Weitzman and River Island, you’re sure to find a pair that takes your fancy and suits your pocket too.